Jihadis Recruiting Under Army’s Nose? Or With Army’s Blessing. COAS Gen Raheel is saying all the right things. Terrorists will be ‘chased down‘ and the militant threat will be eliminated from the country. But beside those words, the reality on the ground looks very different. While Army is supposedly rooting out militants from every hiding place, extremist militants are actively recruiting among IDPs under the guise of charity work. These groups are not operating under secrecy, however, but are working hand in hand with Army, raising serious questions about whether or not Army has given up its belief in such a thing as ‘Good Taliban’, and whether Zarb-i-Azb is nothing but a continuation of failed security policies of the past. Jihadi militant group Jamaat-ud-Dawa was officially banned in 2008, but like many things, that ‘ban’ was worth less than the ink used to write it down. JuD Amir Hafiz Saeed has openly recruited militants to wage jihad, and was a key figure in Difa-e-Pakistan, a coalition of extremist groups believed by many to be supported by the ISI. 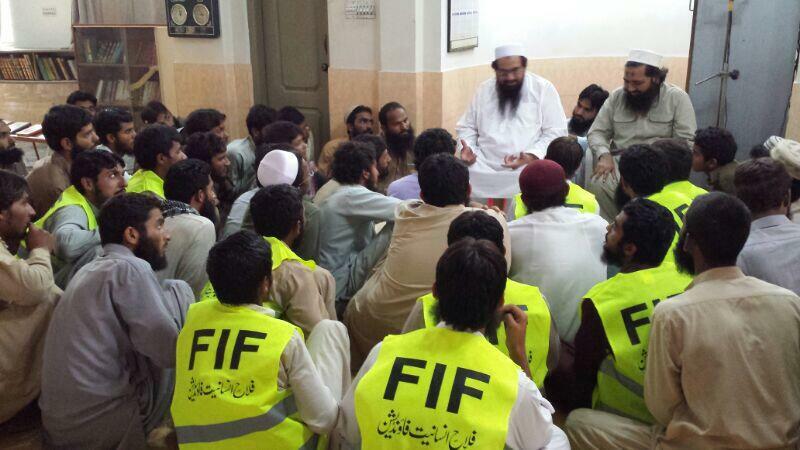 Shortly after JuD was supposedly ‘banned’, a new branch was formed with the name Falah-e-Insaniat Foundation. This group also operates under the guise of charity work in a cynical ploy to buy the affections of desperate people and recruit them for jihad. This is not speculation, but the statements of FIF organisers. At first this camp’s organisers are reluctant to speak to me. “We don’t talk to the media because you publish anti-Sharia stories,” says one of them, identifying himself as Maqsood. But upon my insistence he opens up and even tells me that his organisation is involved in jihad in Kashmir and Afghanistan. “We are the soldiers of Allah and we are here to help our Muslim brothers,” he says. Behind him, a poster bears a picture of the Eiffel Tower with “Eurabia” written across it in English, below which there is an appeal to contribute to jihad in Syria. This statement was taken from an IDP camp in North Waziristan, where JuD/FIF was openly recruiting for jihad with the cooperation of Army itself. “The Pakistan Army is really cooperative towards us,” says Mohammad Sarfaraz, the chief organiser of the JuD camp. “We were the first ones to set up a greeting camp to receive the IDPs even though that area was in the red zone. This is the time to win the hearts and minds of these refugees, whom the government is failing. And the North Waziristan people are grateful to us. Many of them have promised to work for us — and that too for life,” he proudly adds. Despite the terrible situation facing IDPs, JuD/FIF are spreading conspiracy theories against foreign NGOs that have more resources and can provide better treatment for the desperate people. Sadly, the government is only happy to assist the militants with their recruitment efforts by announcing a ban on NGOs to carry out relief work to help the almost 1 million IDPs, leaving the opportunity to ‘win the hearts and minds’ in the hands of jihadis. The conclusion of Zarb-i-Azb operations has yet to be written, but the facts behind the media spin are not comforting. The national security can only be defended if Army abandons its long-held belief in ‘Good’ Taliban. Judging by the ‘Good’ Taliban’s ability to openly recruit in restricted areas, it appears that this mistaken belief is still strongly held. This entry was posted in Blogs and tagged Falah-e-Insaniat Foundation, Hafiz Saeed, Jamaat-ud-Dawa by Omar Derawal. Bookmark the permalink.